Introducing the Solidoodle 2 – just $499, fully assembled! 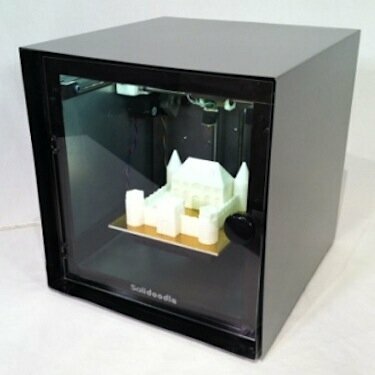 Just six months ago we wrote that the Solidoodle 3D printer was released for $699, being the first fully assembled 3D printer to break the $1,000 barrier. Now we are here to tell you that they have improved the Solidoodle and lowered the price to just $499! Now we’re getting to the price of an iPad. Just amazing. Not only does it come fully assembled, it (well, the Expert model) looks like it’s something that is fully assembled, not like other hobbyist kit 3D printers that my wife wouldn’t ever let me place on the kitchen table. The Expert model looks somewhat like a small oven or microwave. And the darn thing — any model — is strong–their site says a 200 pound person can stand on it’s steel frame with no damage. The main difference of the Solidoodle 2 and its predecessor is that it’s build area has increased from 4″ x 4″ x 4″ to 6″ x 6″ x 6″. That’s 216 cubic inches versus 64 cubic inches. It uses 1.75mm plastic filament (ABS recommended) and it’s exterior dimension with the case on is 11.5″ x 11.75″ x 11.75″ case footprint (LxWxH). Paying $499 will get you the “Basic” Solidoodle 2. That comes with an acrylic build platform, which the site says is good for doing small prints. Spend $549 and you will get the “Pro” model that comes with a heated build platform (1/8″ aluminum plate), which allows you to build large prints up to 6″ x 6″ x 6″ without any bottom warping. You’ll also get an upgraded power supply, a spool holder to hold the filament, and interior lighting. Spending $599 will get you the “Expert” model, which comes with the outer cover and front acrylic door you see in the photo, to give your printer that finished look with clean lines. So, if you want it to look like the photo, and be able to print the largest possible parts, you need to buy the Expert model for $599. If aesthetics are not important to you, get the Pro model for $549. I don’t see any excuse for not at least going to the Pro — what’s the use of having a 6″ x 6″ x 6″ build area if going beyond 4″ x 4″ x 4″ will end up warping. As for the ordering the Expert, just to get the case, the unit actually looks pretty good even with it off, with that nice looking frame it sits in; so you might not need to spend the extra $50. The man behind the Solidoodle is founder and CEO Sam Cervantes. He knows a thing or two about 3D printing, being not only an engineer, but he once served as the Chief Operations Officer of 3D printing company MakerBot until 2010.